Authorities in Pakistan's Bajaur tribal region have promised action against military personnel who detained and beat a doctor, sparking protests. Medics went on strike and the military was criticised after Dr Abdul Hameed was held for several hours on Saturday. Protesters accused the army and its Inter-Services Intelligence (ISI) spy agency of "state hooliganism". Campaigners say tens of thousands of tribal residents have been killed or disappeared during years of conflict. Doctors in Bajaur called off their strike on Monday after the military made concessions. Protesters had threatened to extend it to other parts of the country. The concessions include exempting doctors from being stopped at military checkpoints in tribal areas. The army authorities also promised to curb the number of soldiers allowed to seek medical treatment at civilian hospitals, a constant source of complaint from locals. Pressure on the military had been building since Saturday's incident. Dr Hameed, who works at the Agency Headquarters Hospital in Bajaur's main town Khar, was roughed up while he was attending a female patient in his room. "Two men in civvies walked into the room and wanted him to see a patient they had brought," his brother, Hamid Khan, who is also a doctor, told the BBC. "The staff helping the doctor asked them to wait outside, but instead they stepped up to the doctor and one of them shook hands with him. The doctor got a bit impatient and refused to shake the second man's hand, asking them to step outside and wait till he was finished with his patient." The two men then pounced on his brother, Dr Khan said. They called in some other colleagues and roughed up the doctor and other staff. "Then they dragged my brother by the hair, shoved him into a truck and drove away." Dr Hameed was released only after the doctors and other hospital staff shut down all services and medical stores in the main markets of Khar also pulled down their shutters. 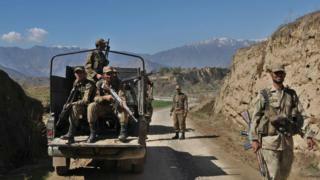 The incident was widely discussed on social media, with activists criticising the military and the ISI of treating the Federally-Administered Tribal Areas (Fata) as their fiefdom. In a video shared on Facebook, a tearful Dr Khan told protesters that people would "not allow the ISI to kill their children". "Are you a protector of the people, or are you a murderer?" he said, addressing the ISI. "Why do you want to turn the children of this nation into your enemies?" Fata is a semi-autonomous strip of land along Pakistan's north-western border. It was used as a base for anti-Soviet Islamist militants during the Afghan war of the 1980s and became a Taliban and al-Qaeda sanctuary post-9/11. Thousands of Fata people are believed to have been killed during this period. A military operation to clear out anti-Pakistan militants in 2014 displaced nearly a million people. Residents have faced layers of security checks on all entry-exit routes to the area. Non-locals, including the mainstream media, are barred from travelling to Fata. The area is also outside the sphere of Pakistan's regular system of justice, and is ruled under a colonial-era law that prescribes collective punishments to tribes for violations committed by individuals. But since January, protests have erupted in several parts of Fata and Pakistan's north-west, mostly over "extrajudicial killings" and procedures at security checkpoints. A movement which started after one such death - the alleged extrajudicial killing of a tribal youth in Karachi - was the first to criticise the military's actions in tribal areas. The Pashtun Protection Movement appears to have opened the floodgates for public criticism of the military, something which had been unthinkable until a few months ago. Its leaders claim that more than 30,000 locals have been forcibly disappeared by the military's intelligence network. Many more have had their houses demolished by the military, campaigners say.